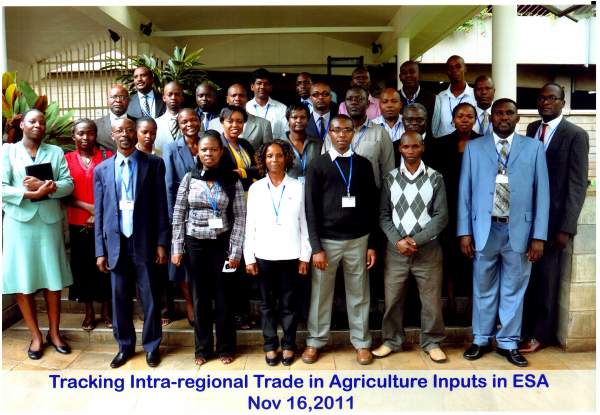 ReSAKSS-ECA Methodology Workshop held on 16th November, 2011 at Intercontinental Hotel, Nairobi, Kenya. While reasonable data exist to allow for computation of indicators of intra-regional trade in food staples, especially the officially recorded trade, the same cannot be said of agricultural inputs. It may well be that trade is taking place at an informal level or that little trade in agricultural inputs is occurring in the region. Thus the proposed methodology will need to take account of the inputs that are significantly traded, both formally and informally. During the workshop, a list of agricultural inputs that are currently traded was developed from the various presentations. However, a consensus on which input to track was not finalized due to complexity involved with available agricultural input data. There are also numerous agricultural inputs, (e.g. seeds), but the main challenge is finding out which seeds to collect data on with differentiated country priorities. Also, it is important to find out which insecticides or herbicides to collect data on with the regionally or nationally differentiated priorities. It was agreed in the workshop to harmonize the proposed inputs, and to track seeds, insecticides and herbicides based on country priority, in addition to also tracking the livestock related inputs. The complexity with tracking agricultural inputs was appreciated with brainstorming and discussions continuing among the agencies with available input trade data. Overall, the workshop was very instrumental in providing a platform for data collection and tracking the progress of agricultural inputs in the Eastern and Southern Africa region. There is optimism that this workshop and continued interaction with the parties involved will help us to further understand the elements of trade and agricultural inputs in the region in to continue to improve agricultural productivity and production, and sustainable food security in the region. This story was compiled by Jonesmus Wambua (j.wambua@cgiar.org) of ReSAKSS-ECA. For more information contact ReSAKSS-ECA Coordinator Joseph Karugia, (j.karugia@cgiar.org).